Sweet Ice: Happy Valentine's Day! 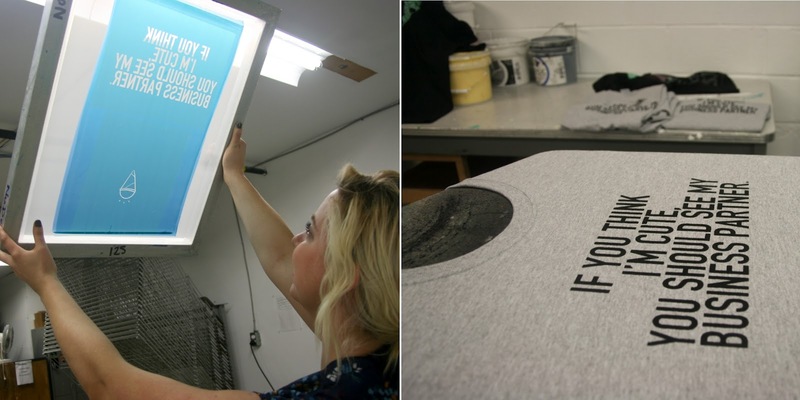 If you saw last week's post, you'll know that we silk-screened some t-shirts at The Print Studio. We made these as gifts for some of our favorite business partners in Hamilton - here are a few more photos from our time at the studio, since we didn't do the big reveal last week. Again, we had such a great time at The Print Studio, and highly recommend taking a workshop there. It was so fun and a really wonderful learning experience and now that we have memberships, we can go back and screen-print any time we want to! 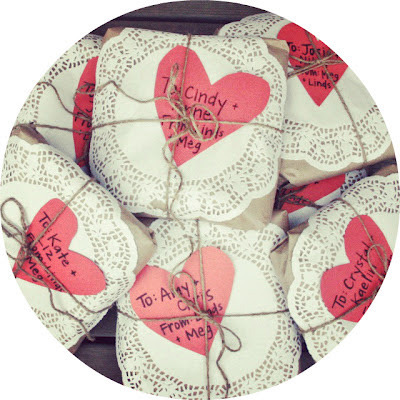 Okay, so here we go with our Valentine's deliveries! Gahh, so much fun! 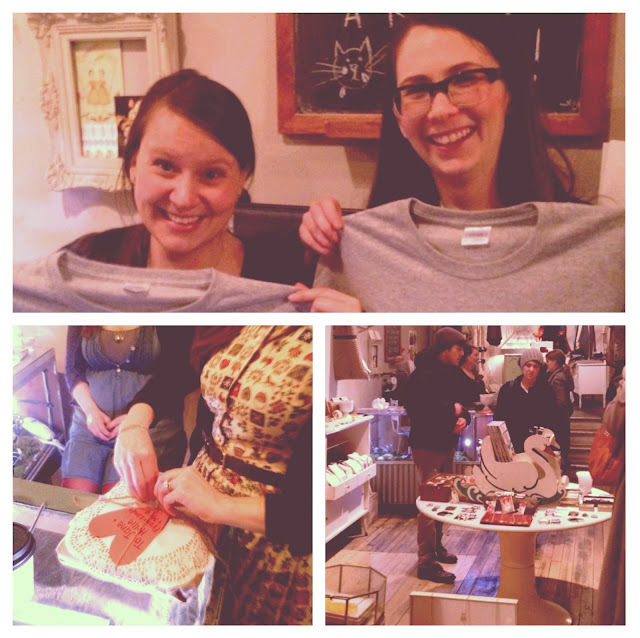 Stop #1: Cake + Loaf! (The best bakery in town...in our opinion). They are so sweet - they knew we were coming and had amazing Valentine's cookies waiting for us. YUM! Cake & Loaf is such a nice place to stop in - you're always greeted with a big smile and an amazing selection of goodies to choose from. Stop #2: Needlework! This stop was so fun and giddy. Kate and Liz squealed and immediately tried on their shirts. We had a hilarious argument: "You're the cutest business partners" "No, you're the cutest business partners!". It was also the day of their grand opening (which happened during the Art Crawl and was a huge success), so there was so much excitement in the air! Congrats on such an amazing endeavor, Kate and Liz! Stop #3: The Cannon! This is our favorite coffee shop in the city, but I suppose we're a bit biased. But REALLY - it's so great. Anne and Cindy are dear friends of ours, and have recently opened Cannon Coffee Co., where they serve amazing coffee and bake up absolutely delicious treats. There's a great fresh-but-cozy atmosphere and you'll always be swept off your feet with Anne and Cindy's pleasant smiles and conversation. Go there, k? Stop #4: Kitestring! Well, this was fun! There was just so much screaming and laughing and of course we got to partake in the Kitestring-stash-o-candy. You can tell that Chris and Jenn have a lot of fun together but there's also a really deep friendship and mutual respect that is really evident, and that's so great to see. What nice business partners! Stop #5: White Elephant! If you know Hollie and Jane, or if you've ever been to White Elephant, you'll know that these girls are a power couple (in the business sense of the word)...there's nothing they can't tackle! Their store is gorgeous, their banter is hilarious and they're just delightful people in general! We stopped in here during art crawl, and as usual, the shop was just packed (with people and amazing merchandise!) Yay! Stop #6: Detour! Unfortunately we couldn't catch Kaelin, but we did stop in and see Crystal. This husband-wife duo and their wonderful coffee shop is a reason to visit Dundas in itself...what began as an amazing direct-trade roastery has turned into an incredible cafe, and it's been amazing to see these two work together towards their dreams. Also, they are our source for the beans we use for our Sweet Espresso syrup! Stop #7: Our final stop! We met with Chris and Amy - future owners of what will surely be an amazing coffee shop in the core (#cafeoranje). While their doors aren't open for business yet, you can already see that these two are an amazing match when it comes to working out your dreams and running a business together. It was such a joy to sit down for coffee with them and hear about their process so far, and we can't wait to support them on this amazing whirlwind adventure! 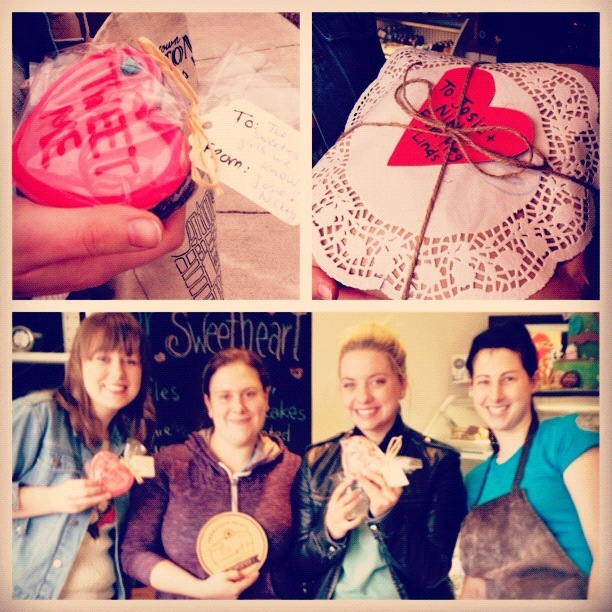 We had an amazing time delivering our Valentine's Day gifts! It's such a honor to know all of these people and to gain from their knowledge and experience. During this process we've realized that this is only be 'Round One' of handing out these shirts, because there are just so many other talented and inspiring (and cute!) business partners in Hamilton. It's just thrilling to be part of a city with so much talent and with such excitement in the air! It was also nice to catch up and share a bit about what we have in store for Sweet Ice - which you'll be hearing about soon! Lots on the horizon for these business partners! Such a cute and great idea! 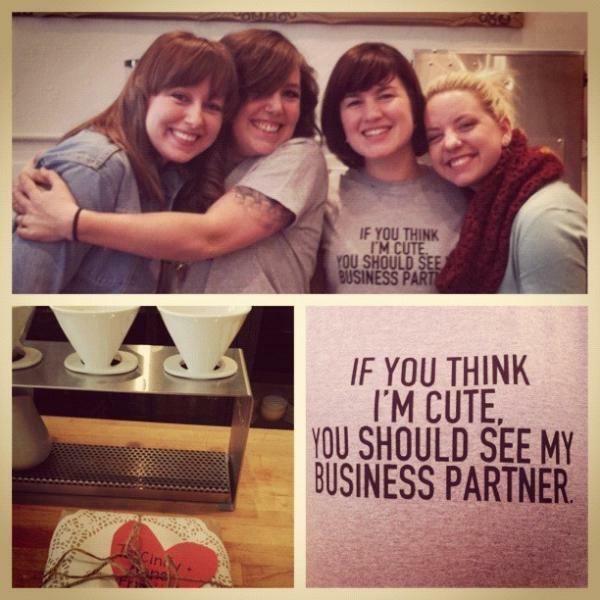 Makes me so excited to eventually move to Hamilton, seeing all those fun business pairs.